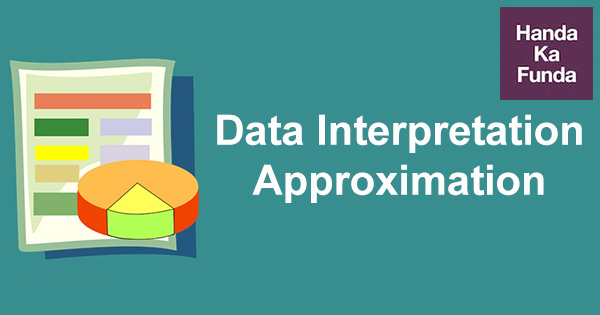 Data Interpretation questions typically have large amount of data given in the form of tables, pie charts, line graphs or some non-conventional format. The questions are calculation heavy and typically test your approximation abilities. A very large number of these questions check your ability to compare or calculate fractions and percentages. If you sit down to actually calculate the answer, you would end up spending more time than required and most of us can’t afford to lose precious time during competitive exams like CAT, XAT, IIFT etc. Here are few ideas that you can use for approximation. When trying to calculate (approximate) a fraction ‘p/q’, add a value to the denominator and a corresponding value to the numerator before calculating (approximating). Case 1: 762 is 12 above 750, so I will subtract 12 from the denominator. Keeping the factor of 2.5 in mind, I will subtract 30 from the numerator. As you can see, with very little effort involved in approximation, we got really close to the actual answer. As you can see, even this is close to the answer. If you add the same number to the numerator and denominator of a proper fraction, the value of the improper fraction decreases. 1/2 < 2/3 < 3/4 < 4/5..
and 3/2 > 4/3 > 5/4 > 6/5..
Let’s first compare 117/229 & 128/239. If we add 11 to the numerator and the denominator of the first proper fraction, the resulting proper fraction would be 128/240, which will be bigger than the original. Now let’s compare 117/229 and 223/449. If we add 11 to the numerator and the denominator of the second proper fraction, the resulting proper fraction would be 234/460, which will be bigger than the original. If we double the numerator and denominator of the first proper fraction, the resulting proper fraction would be 234/458. Note: This question can be solved much simply by just looking at the numbers and approximately comparing them with 1/2. I used this long explanation to illustrate the funda given above. #Given below are few other shortcuts that might come in handy in calculations. Note: Derived from the Binomial theorem, this approximation technique works best, when the value of r is small. If the rate goes above 10%, then this approximation technique gives bad results. Also, if the rate is 5% then r = 0.05; if the rate is 7.2% then r = 0.072. Note: There are only two exceptions to this funda. I hope someone in the comments will point them out. As I end this post, I am also wondering if “Approximation of Dreams… Oops! Data” would have been a better title.